School of Law Diploma Ceremony: Sunday, May 12, 2019 at 5:45 p.m. George W. Woodruff Physical Education Center (WoodPEC). 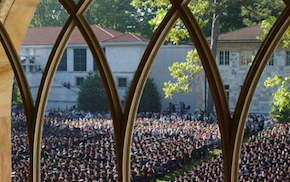 174th Commencement Exercise of Emory University: Monday, May 13, 2019; 9:00 – 10:15 a.m. on The Quadrangle. The following Honors lists reflect achievements as of May 16, 2018. Below is a helpful month-to-month check list to get you ready for graduation. Please keep in mind that some dates may change, so please be sure to check the Registrar’s Web page for updates. All schools at Emory University participate in online graduation application submissions. Students may apply to graduate through their OPUS accounts online. You will be available to apply for graduation in OPUS January 8, 2019, through February 8, 2019. Be sure to check the degree information displayed to ensure your diploma will be ordered correctly. Confirm that your name is spelled correctly in OPUS. How your name appears in OPUS is how it will be listed on all commencement-related publications, including your diploma. The name change deadline is February 28, 2019. Are you applying for the degree you think you are? Verify this information. Confirm that your diploma mailing address is accurate and will be valid for you for a minimum of 6 weeks after commencement ceremonies. After February 8, 2019, late degree applications must be completed using the paper form available here. Students submitting a late degree application must submit ONLY the paper form to the Law Registrar in G144. Students will then have to take a $25 late fee, in the form of a check made payable to the university’s Registrar Office, directly to the office at 200 Dowman Drive, Boisfeuillet Jones, Center, Rm. 100. The Law Registrar cannot accept any payments. Please understand that eligibility does not necessarily mean you have met all graduation requirements for your degree program. You can order regalia at a grad fair or online at emory.shopoakhalli.com from February 8, 2019, until March 7, 2019. Be certain you order the correct regalia for your degree type. JM graduates, per B&N guidelines, must purchase regalia. JD/LLM/SJD graduates can rent or purchase their regalia. Note: Any JD/LLM/SJD graduates who wish to purchase regalia must complete a Custom Regalia Purchase form and turn it in to Heather LaFleur at hlafleu@emory.edu by March 7, 2019. The purchase option is not available online. Regalia pick-up will be available at Emory’s Barnes & Noble bookstore starting on April 17, 2019. Please note JD graduates must complete the ABA Required JD Graduate Survey before picking up their cap and gown. Rented regalia must be returned May 14, to May 17, 2019 to the Emory University Barnes & Noble bookstore. The School of Law will host a Grad Fair in Hunter Atrium on Monday, February 11, 2019, from 9:30 a.m. to 2:30 p.m. and again on Wednesday, February 13, 2019, from 11:30 a.m. to 5:30 p.m.
Barnes & Noble will help students order caps and gowns online. GradImages will provide cap and gown photography, with no appointment necessary. Come photo-ready. Cap and gown will be provided. Jostens will take announcement orders (February 11 only). Herff Jones will take orders for class rings and frames. If you do not rent your regalia beforehand, none will be provided for you. Regalia is required to walk in the Diploma Ceremony and the Commencement Exercises. Be certain you order the correct regalia for your degree type. Not all School of Law graduates wear the same type of regalia. Graduating students must meet the following requirements before commencement. Financial Aid Exit Interview: Please do not forget to complete your exit loan interview online here. Clear Final Charges: To avoid a university hold on your diploma, pay all outstanding tuition, health services charges, parking, and library fines now. This information can be found on your Student Center page in OPUS. Only JD students are hooded during the diploma ceremony. Many choose to be hooded by the faculty member voted Most Outstanding Professor. You may request a guest hooder, as long as the hooder holds a JD degree. Complete the Hooding Request Form to request a guest hooder. If you would like afaculty member to hood you, complete this form. The deadline for submission is Monday, April 22. We will provide a reserved seating section so that each hooder can easily access the stage, or hooders can choose to sit in the bleachers. Please advise your guest hooder that only two seats will be available in the reserved section, one for the hooder and one for the hooder’s guest. Guest hooders should dress in business attire; regalia is not required. We recommend that guest hooders arrive by 4:30 p.m. to ensure they can find parking and their designated seating prior to the start of the ceremony. Hooder names will not be read, but their information is required for verification purposes. We will provide a briefing to your hooder in advance of the ceremony, via email. Detailed information about the hooding process will be provided closer to graduation. To help us pronounce your name correctly during the Diploma Ceremony please be sure to submit the pronunciation of your name here. The deadline for submission is Monday, April 22, 2019. Accommodated seating requests (includes disability, impairments, or access issues) must be made in advance for both the Law School Diploma Ceremony and the Emory University Commencement Exercises. Please check with your loved ones to determine if accommodated seating is needed; it MUST be pre-arranged. You must submit forms for BOTH ceremonies, as they are administered differently. All requests must be submitted by Friday, May 3, 2019. To submit an accommodated seating request for the law school’s Diploma Ceremony, please use this form. To submit an accommodated seating request for the Emory University Commencement Exercises, please use this form. All accommodated guests will get one additional seat for someone to accompany them. If a guest’s or the guest’s assistant’s name is not on the submitted list, they will not be able to sit in accommodated seating. Students who wish to graduate in absentia must obtain permission from the Dean or his/her designee. In this case, the diploma will be mailed to the student’s permanent address listed in OPUS. If you will not complete your degree requirements until summer 2019 or fall 2019 but would like to march in the Diploma Ceremony with the spring 2019 cohort, please complete the form found here. ABA Required JD Graduate Survey (JD Students Only): Please plan to complete your graduate survey by the month of April; it must be finalized before you can pick up your graduation regalia. Please be on the lookout for an email from the Career Center regarding this survey. Note: ABA Required JD Grad Survey must be completed before you can pick-up your regalia. If you chose to have your regalia delivered to the Emory Barnes & Noble bookstore, regalia will be available for pick up starting Wednesday, April 17 from 10:00 a.m. - 5:00 p.m. Emory Barnes & Noble will do a Grad Fair on Wednesday, April 17 from 10:00 a.m. - 4:00 p.m. at the Emory Barnes & Noble bookstore. Students will have another opportunity to take cap & gown photos with GradImages. Details will be posted in April. Diplomas will be mailed in July to the “Diploma Address” you have listed in OPUS. Please be sure to verify that the “Diploma Address” you have listed in OPUS is correct. Diplomas will not be available for pick-up from the law school. This is a reminder to all students to please remove your belongings from your lockers and leave them unlocked after your last use. All lockers will be emptied out beginning the week of May 25, 2019. Please note the following: You are welcome to keep your locker if you plan to stay this summer to study for the bar exam and can keep your locker until after the bar exam. Please be sure to contact Amish Mody and provide your name and locker number. The deadline is May 25, 2019, to keep us from emptying your locker. For returning students, the Operations Department will be sending instructions for locker access in the Fall. The Emory University website includes information on hotels and restaurants for out-of-town guests. Grad Images will be the official photographer for the School of Law’s Diploma Ceremony. The photographers will be taking pictures of the ceremony, which you will be able to purchase. Each graduate will be contacted directly by Grad Images when pictures are available for order. Graduates can also go to www.gradimages.com to find their photos after graduation.